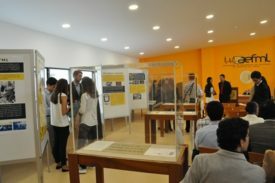 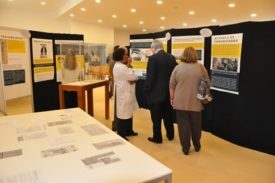 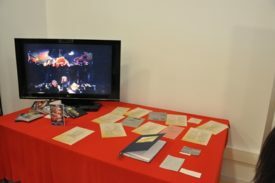 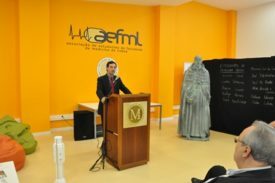 Last Tuesday, 23 September 2014, the month in which the Students Association at the Faculty of Medicine, University of Lisbon celebrated its 100th anniversary, the Centennial Hall and the Exhibition were formally inaugurated and the latter was open to public. 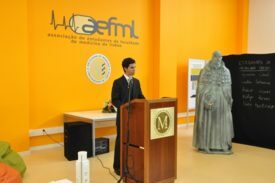 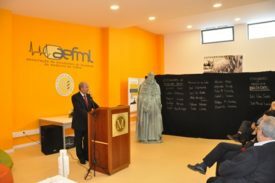 The current President of the Students Association, Tomás Silva, the outgoing President, Maria Wilhelmina, the Vice Dean of FMUL, Professor Miguel Castanho, and Dr. Carlos Martins, Chairman of the Board of Directors of the Hospital of Santa Maria took the floor to a room packed with students, researchers, teaching and non-teaching staff from the Faculty of Medicine as well as other guests. 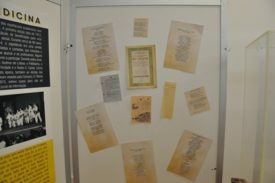 After the speeches the audience was invited to the unveiling of a Commemorative Plaque at the entrance to the room, followed by a Celebratory Port in the adjoining terrace bar.